Does you have an electric fuse box or electrical panel in an odd place at your home? Maybe it’s in the living room, kitchen, or hallway. You know right for every one to see! Our fuse box is in the hallway and is visible from the kitchen, dining room, and entrance. 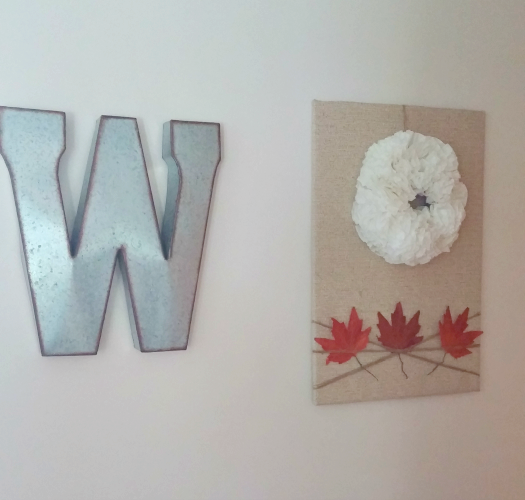 For the past year I have been trying to figure out how to cover the fuse box up while still keeping it easily accessible (my husband’s only request) and decorative. I came up with an inexpensive solution! 1. I bought 2 foam poster boards from Dollar Tree and taped them together using packaging tape. The poster boards were the perfect size for my electrical panel, but I know some panels are much longer than mine. You may have to cut and tape additional boards together. 2. Next, I stapled fabric to the back of the boards. This fabric was left over from a previous project. It has a similar look to burlap, but much smoother, and it was cheaper than burlap because I found it on clearance at JoAnn’s Fabric Store. 3. To hold the poster board to the fuse box, I hot glued magnets to the back. It works great because it can easily be taken off the panel. No nails, hooks, or screwdrivers needed! 4. Then I shopped my house to decorate the boards. 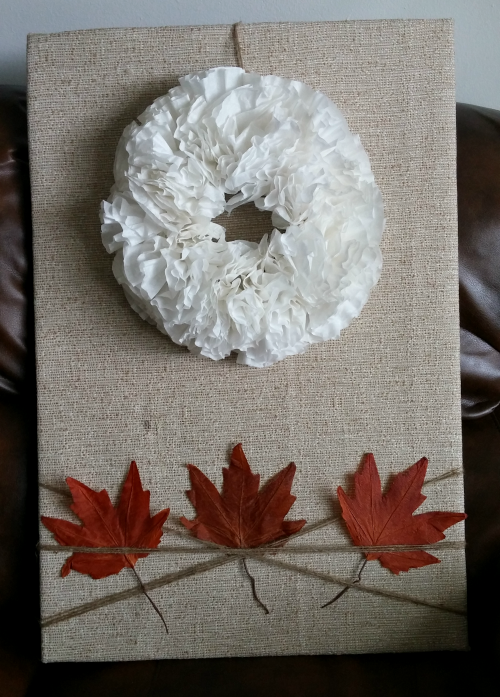 My coffee filter wreath seemed to be just right for the top. So I attached it with a string of twine and some hot glue. By the way, you may want to check out how I created a wreath for free out of plastic grocery bags! 5. I also wrapped twine around the bottom section in a criss-cross pattern with a third section of twine through the “x”. 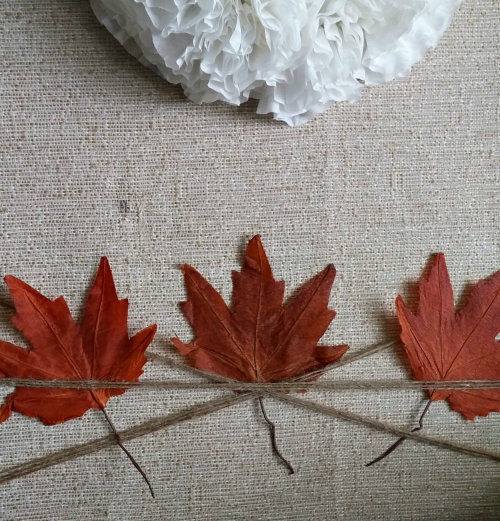 For now leaves are decorating the bottom section, but it will be fun to change them out at Christmas with berries or greenery. Who knew my electric panel could be another place to decorate for the holidays! Thanks, Whitney! I enjoyed putting the video together. I'm looking forward to joining you for Vlogtober! I love this idea! All of our fuses are outside I think. At least i've never seen a fusebox in our house or they're hidden cleverly. But this is such a cheap way to hide something that's necessary to the house but ugly to your eyes. No ugly "before" picture of the exposed fuse box? Oh well, the finished product looks great. Much better than a fuse box staring at you in the face! LOL Jenny. I spared you the ugly before picture! Great idea, it looks incredible, I would never have realized that there was anything behind the canvas. 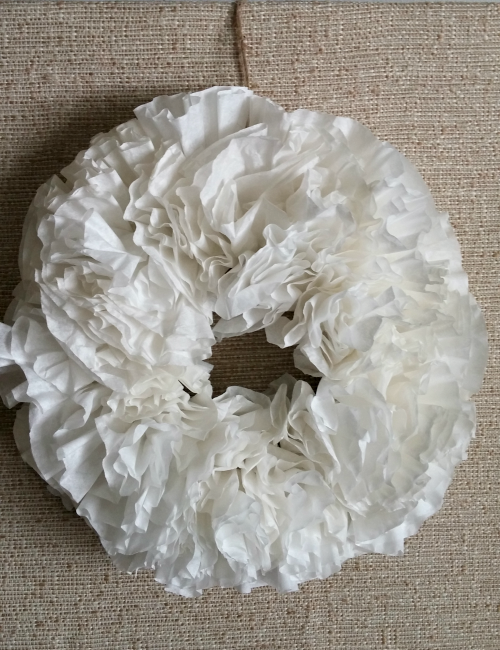 And I love the coffee filter wreath! I love creative solutions like this. Great job! Thank you, Nikki! I'm glad it doesn't look like there is a fuse box behind the cover. It took me awhile to figure out how to cover it up, but I am happy with the outcome.